ENC Designer is the central application of the SevenCs ENC Tools production suite. It is a powerful and very easy to use software that has been developed for the production of S-57 Electronic Navigational Charts (ENCs). 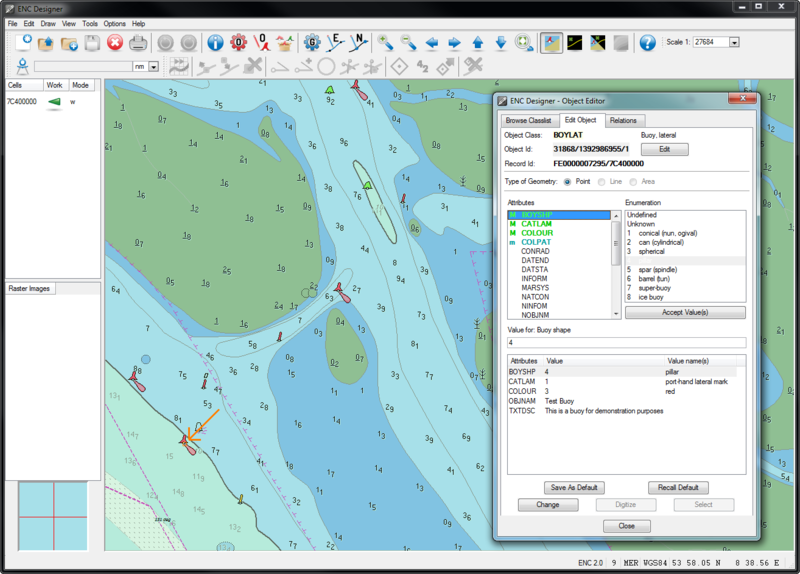 Chart production with ENC Designer is not limited to ENCs – Inland ENCs, AML, Port ENCs and bathymetric ENCs are supported as well. ENC Designer is supplied as a package with ENC Manager and ENC Referencer. Chart production work with ENC Designer can be done on a standalone basis or integrated into a flexible chart production workflow which is controlled by ENC Manager. Updates, new chart editions or S-57 Exchange Sets are easily created. The S-57 chart data sets are stored in the ENC Manager repository. ENC Designer’s user-friendly edit functions make it easy to apply new objects or to change existing ones. Extensive functions allow you to query data sets by ensuring a quick identification of object definitions. ENC Designer supports automatic line tracing on the basis of raster backdrops (geo-referenced image files). The respective chart images are geo-referenced with ENC Referencer. While your production work proceeds you can see the chart features being presented like in an ECDIS Chart Display. Simply switch to another display mode to view the spatial primitives of your data. Moreover, you can also view S-57 feature and spatial objects simultaneously. ENC Designer supports import of depth data in ascii format – also referred to as xyz data. A pre-defined bathymetry colour palette is used to visualize the data. The user can set parameters to specify the colour display at discrete depth ranges. The Bathymetry Mode is very useful to compare charted contour lines and its source bathymetry. 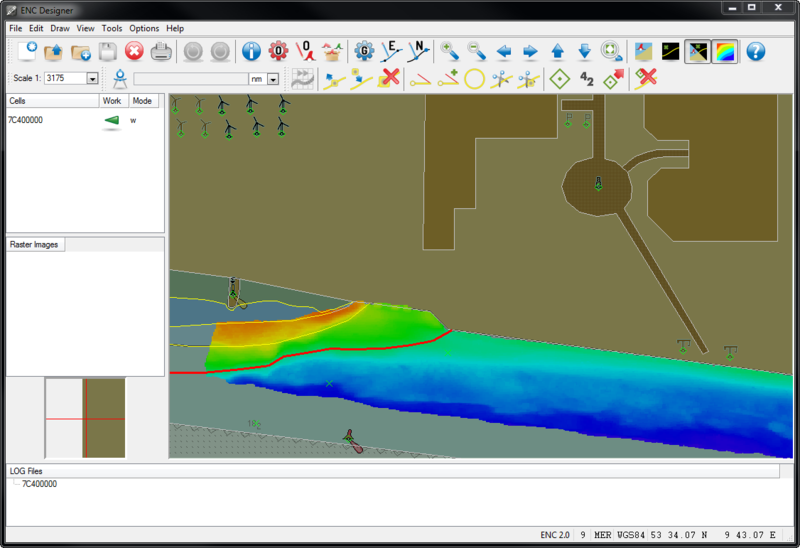 Bathymetry data for example that was processed in ENC Contour Generator can be displayed in ENC Designer to review the contouring results.